This new Armoured ROBO-PTZ camera range is a great choice for indoor surveillance of warehousing and other similar "voluminous" storage areas due to its built in and directional Infra-Red illuminator. Wherever you point the camera you also point the IR illuminator for great low light surveillance. The IR illuminator has an effective range of about 30 metres indoors but please note the illumination is a narrow angle of about 15 degrees so it doesn't produce a floodlight effect, more like a powerful torch. The ROBO-PTZ has more vandal resistant features than a standard PTZ dome and offers more of an obvious deterrent as you can see it rotate. The lens and IR illuminator almost give it "eyes" so you know when its looking at you! The built-in multi-protocol controller card means its easy to integrate into other CCTV systems with Pelco-D, Pelco-P and 14 more popular protocols built in as standard. Alarm inputs give the ROBO-PTZ even greater flexibility. For example if you used it in a warehouse you could trigger the PTZ to automatically zoom in on a roller shutter door by linking the door to one of its alarm inputs. PIRs, door contacts or other triggering methods can all be used with the appropriate interface to trigger it. 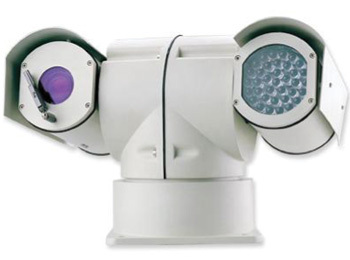 Built to a high standard, the ROBO-PTZ can also be mounted on to of a vehicle for mobile surveillance. A separate shock absorber is included that helps mount it on a vehicle and lessens vibration when travelling to the location requiring monitoring. This PTZ camera head is now available with either 22x 30x or 35x Zoom options, please be sure to select your required option from the options menu.